Earlier this month, Trans-Siberian Orchestra hit the road to begin delivering its annual blast of Yuletide bombast to arena audiences across America. As usual, the group's touring party includes guitar players whose resumes boast of stints alongside major names in rock (Alice Cooper), pop (Cher), metal (Megadeth), prog (Asia), new age (Kitaro) and even polka (18-time Grammy winner Jimmy Sturr). There's another guitarist, however, whose presence is felt at each and every TSO show, from the songs the band performs to the merchandise they offer for sale - Criss Oliva, who died 25 years ago last month at the age of 30. Without the template of guitar-driven, theatrical hard rock that he and his bandmates in Savatage - the pioneering metal band from which TSO spawned - established in the late 1980s and early 1990s under the guidance of late producer Paul O'Neill, Christmas would sound much different today. The full tale of how Savatage birthed and was ultimately devoured by TSO - whose 20th anniversary tour is expected to sell more than 1 million tickets this winter - is bizarre and complicated, but the roots of both groups can be traced back to suburban Tampa, Florida, where in the late 1970s, a Michael Schenker-worshipping teenage Criss and his older brother Jon decided to start a band called Superguys. Several years later, the pair - who by then had formed another group, Savatage - recorded that band's debut album, Sirens. A primitive but powerful blend of thrash and speed-metal, Sirens was among an incredible freshman class of records released in 1983, which also included seminal debuts by Metallica, Slayer and Queensryche. Perhaps its biggest impact was the prolific Tampa scene it helped to spawn, as local groups such as Death, Deicide, Morbid Angel and Obituary would follow in Savatage's footsteps by tracking at the city's Morrisound Recording. “Savatage was one of the original pillars of the Tampa music community, and Criss’s unique and passionate style was a huge contributing factor,” says David Vincent, former vocalist and bassist of Morbid Angel. The reach of Sirens extended well beyond the city's borders, though. Among those whose attention it piqued was a California teen who had studied with Joe Satriani - Testament guitarist Alex Skolnick, who cites Criss's use of octaves in the album's title track as the inspiration to utilise octave melodies of his own in several Testament songs. Sirens also caught the ear of an executive at Atlantic Records in New York City, who would play the album repeatedly to tease a friend and colleague, a young A&R rep named Jason Flom. Eventually, Flom - who would go on to sign a number of multi-platinum acts, including Stone Temple Pilots, Hootie & The Blowfish and Kid Rock – flew to Florida to see the band play for himself. Flom subsequently signed Savatage to Atlantic, and the group soon found themselves recording their major-label debut, Power Of The Night, with Blizzard Of Ozz producer Max Norman. The album - released in May of 1985 - sold respectably but failed to yield a hit single, which led the band to make a near-disastrous misstep the following year. Fight For The Rock - widely seen as the weakest album in the Savatage canon - showed little of the razor-sharp edge that put the band on the map. Even worse, the commercial gamble fell flat, and by late 1986, the group was not only on the verge of getting dropped by Atlantic, but disbanding altogether. At that point, Flom asked an industry friend from New York - an up-and-coming producer and songwriter named Paul O'Neill, who had previously worked for a top music management firm that represented Aerosmith, Scorpions and Def Leppard - to see Savatage live and consider helping them find their way. O'Neill arrived late, but the band left an impression on him nonetheless. O'Neill and the Oliva brothers soon began laying the foundation what would ultimately become 1987's Hall Of The Mountain King, the first spoils of a writing partnership that would flourish in subsequent years. Featuring anthemic, riff-driven songs like the title track and Strange Wings, the album outsold its predecessors and got Savatage back on track. It also saw the group forge new ground via their first instrumental, Prelude To Madness, a metal mash-up of famous works by two classical composers - Edvard Grieg's In The Hall Of The Mountain King and Gustav Holst's Mars, The Bringer of War. 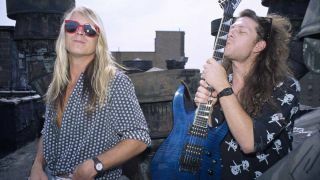 Although Savatage only performed the song live a handful of times, Prelude To Madness encouraged the band to continue experimenting with classical and symphonic influences on their next two albums, 1989's Gutter Ballet and the 1991 rock opera Streets. The scope of Criss's playing grew in turn and earned additional admiration from Skolnick, who finally met Criss in 1990 when Savatage opened for Testament on an American tour. Although many fans cite Streets as Savatage's creative peak, the album struggled to find an audience upon its release. Grunge - which embraced much of punk's stripped-down mentality and modest musicianship - was the hot new sound; a grandiose, conceptual metal record that sounded like the love child of Queen and Black Sabbath didn't stand a chance. Criss's playing, however, was only getting better, with his majestic outro solo on Believe delivering the album's knockout emotional punch. After the Streets tour came to an end, Jon Oliva decided to step down as Savatage's vocalist, but he helped the group recruit a new singer, Zachary Stevens, for 1993's Edge Of Thorns. Featuring a more streamlined style of hard rock, the album yielded the band's first hit single in its title track, which peaked at No. 26 on Billboard's Mainstream Rock Tracks chart. Following a successful European tour with Overkill, Savatage was preparing to hit the road in America with Vince Neil on his first-ever solo headlining tour when tragedy struck. Soon after midnight on 17 October, Criss was driving home from a Tampa-area concert when he was struck by a drunk driver, killing him instantly. In an attempt to help his brother through the grieving process, O'Neill suggested to Jon that they write and record a tribute song. One song somehow turned into 10, however, and the pair began to wonder whether it might be possible for the group to continue. From there, they invited Stevens and Skolnick to join them at Morrisound to record what would become 1994's Handful Of Rain. “It was a big honor to be asked to step into Criss's shoes for a time,” says Skolnick, who also guested with the group during American and Japanese tours later that year. In 1995, with Skolnick pursuing other musical interests, the group recruited Al Pitrelli (Alice Cooper, Asia) and former touring guitarist Chris Caffery and recorded its second rock opera, Dead Winter Dead. The album featured a dramatic instrumental, Christmas Eve (Sarajevo 12/24), which received unexpected airplay on several pop radio stations in America during the holidays. With Flom's encouragement, O'Neill, Jon and other members of Savatage formed a new group in early 1996 and recorded an entire album of holiday music that featured Christmas Eve as its centerpiece. The song was re-released that winter under a new name, Trans-Siberian Orchestra, and the rest is history. Since then, TSO has sold more than 12 million albums and performed before more than 15 million fans. One of the highlights of every TSO concert is its pyro-drenched rendition of Savatage's Prelude To Madness. For a number of years, the group also played Believe, introducing more of Criss's music to audiences in the process.